Privacy louvers can offer huge benefits that other fencing options simply don’t have for commercial properties. When it comes to privacy louvers, the primary reason one would be interested in investing in them is built into the name: it’s all about privacy. If you’re working with a commercial property, you’re likely already aware of the value that adding some privacy elements to your property can have and it’s why typical fences are so often seen around those kinds of properties. Perhaps you need to separate a commercial property from other businesses or residential communities, or you may just need to indicate to employees where they should and shouldn’t be, or you may want to protect the privacy of your clients or business partners. Beyond that, let’s take a look at some of the best reasons to install custom privacy louvers on your commercial property. 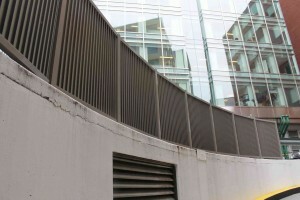 If you’re familiar with the security benefits of regular fences, louvers offer similar—but unique—benefits. You may have even already looked into typical security fencing options, which do have their own advantages, but louvers are set entirely apart. This is because privacy louvers limit visual access to a property much more so than most fence options do. On top of that, custom louvers of course offer limitations as far as physical access to a space goes and are incredibly difficult to be scaled over. Since their structure is so rigid and a well-constructed louver will last decades to come, you can rely on louvers to act as a low-maintenance security option that will work for you when you need it to. Beyond being beneficial in terms of security and privacy, privacy louvers are also fantastic in helping establish a beautiful landscape that will impress visitors and customers. Because louvers are just so customizable, you can go in any direction you’d like, including a variety of color options or even adding aspects of your company’s branding. It’s also certainly the case that louvers are unique and will stand out much more than a fence will, without inviting unwanted visitors to your commercial property. This entry was posted on Friday, November 16th, 2018	at 11:12 am	. You can follow any responses to this entry through the RSS 2.0 feed. Both comments and pings are currently closed.